1. Happy constitution day, Norway! 2. I have very little going on right now. Lying on Valborg's parents' sofa watching trashy TV! Everything else I could post about is in some way or another a bit too in-progress. Tomorrow I'm going to try and make myself finish at least one of them! 3. In a moment of weakness (damn it! the validation of others! it does nothing for my actual self esteem! Why do I rely on it so!) I put my name in the love meme and got lovely answers. Thank you, guys. :) I am actually feeling really embarrassed about having put my name in, for reasons I'm not quite clear on, but I do know I have kind of confused feelings about these kinds of things (as regards me personally, not as regards their general right to existence, because, you know, hah). 4. 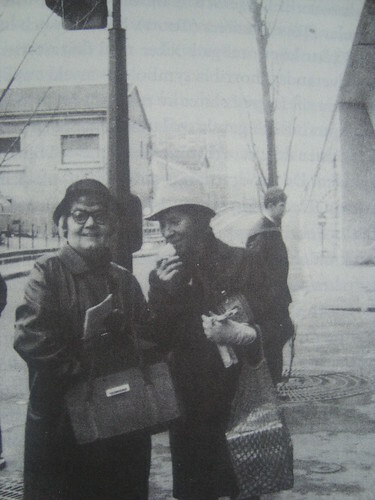 Here is a photo of Tove Jansson and Tuulikki Pietilä which I uploaded for my Tove Jansson Is Amazing post but ended up not using. I kind of love it though. Don't they look like they're up to something terrible? 5. I'm also behind on comments, I'm pretty sure. For this, my apologies. It happens sometimes.